Due to expansion, Vysera Biomedical — a Galway based medical devices company involved in gastrointestinal disease treatment — recently relocated from the Business Innovation Centre at NUI Galway to its new headquarters at BMR House, Parkmore Business Park, Galway. Vysera has grown quite rapidly since inception in June 2005. The company currently employs a number of third level graduates and is enthusiastic about its products and opportunities. It expects to double the number of employees in the next 12 months. Vysera is considered a high potential medical device company and has supporting shareholders in Enterprise Ireland and Enterprise Equity. 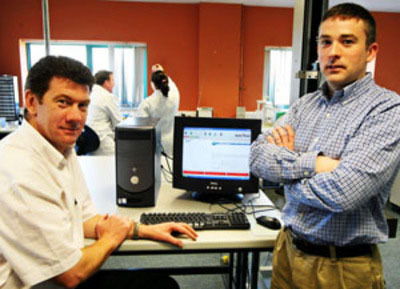 The company was founded by Donal Devery (formally of Digital and Aerogen) and Niall Behan (formally Aerogen and Boston Scientific), both of whom have many years experience in product development and commercialisation in the medical device sector. In addition to the founders Vysera Biomedical has assembled a team of engineers and scientists with considerable experience in both research and product development of biomaterials and drug delivery systems. In the course of research and development the company has formed a medical advisory board by retaining surgeons, doctors, and specialists from Irish hospitals including St James’s Hospital, and international clinics. The company is focused on addressing the unmet needs of surgeons and is committed to developing innovative, breakthrough technology and products that will positively impact the quality of life of patients suffering from conditions of the gastrointestinal tract, such as Gastro Oesophageal Reflux Disease, Barrett’s oesophagus, and oesophageal cancer. Diseases of the inner surface or ‘lumen’ of the gastrointestinal tract affect one in 10 people in western society including Ireland, and have historically been treated using long term medication and invasive surgical procedures. The revolutionary product under development is concerned with an innovative therapy for Gastro Oesophageal Reflux Disease. The company plans to launch the product in 2008 and in doing so will provide a minimally invasive solution to surgeons who are treating patients with this disease. This approach removes any risk associated with surgery or long term pharmaceutical treatment.